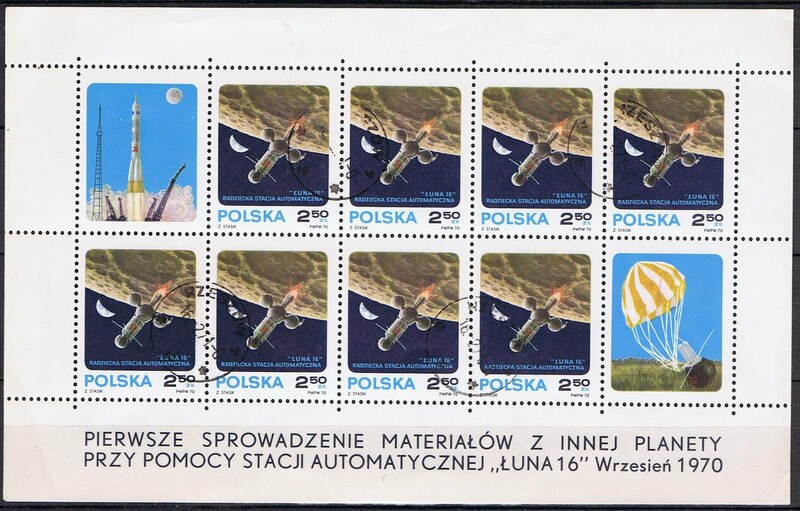 Phab Philately: Poland Goes Luna "16"
On November 20th 1970 Poland issued a sheet of 8, 2.50 zloty, stamps to commemorate the Russian Luna 16 unmanned moon mission. Launched from the Baikonaur Cosmodrome on September 12, 1976 Luna 16 started its descent to the Moon on the 20th of September 1970, it landed on the lunar surface approximately 100 km East of Webbs Crater, in the Sea of Fertility. Within an hour of landing the probe began drilling into the lunar soil to collect a soil sample. After reaching a depth of 35cm (13.77 inches), a soil sample weighing 101 grams (roughly the weight of kingsize chocolate bar) was taken and placed in the probe. On the 21st of September, more than 26 hours on the surface of the Moon the upper stage of the Luna 16 probe departed the Moon. Landing in Kazakhstan on the 24th of September Luna 16 brought its sample back to be analyzed. 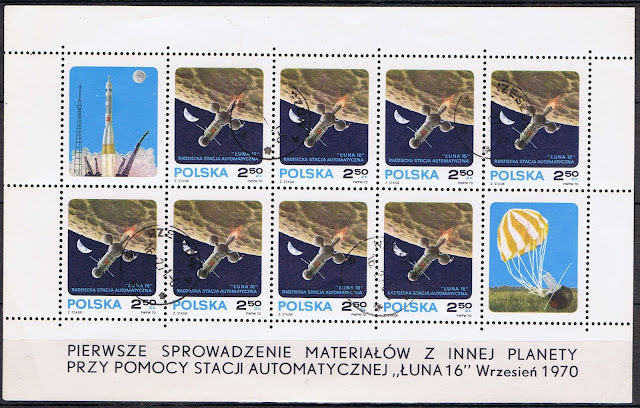 Three soil samples from Luna 16 were sold at auction by Sothebys for $442,500 in 1993.